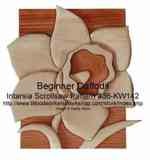 This scrollsaw pattern is a great way for beginners to get a start at making intarsia projects. This Daffodil consists of only 21 pieces and the finished dimensions are approximately 8 inches wide by 9 inches high. The designer has included some helpful tips to get you started. Bought this one and the beginner horse one. Thanks for the patterns.